A Life. A Choice. A Legacy. Tom Rinaldi tells the story of of real-life hero Wells Crowther, a young man who worked in the South Tower of the World Trade Center on 9/11 and sacrificed his own life to save countless others, continuing to go up and down nearly twenty flights of stairs to lead strangers to safety. 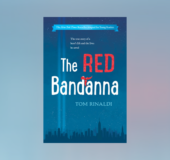 The Red Bandanna is about a fearless choice, about a crucible of terror and the indomitable spirit to answer it. Examining one decision in the gravest situation, it celebrates the difference one life can make. Take it out. Unfold it. Press your hand down upon it and flatten it, into the surface of your desk, or the edge of the bed, or along the line of your leg. Twenty-two inches along any side, four ounces in your hand, barely enough weight to notice. Polyester and cotton, dyed and printed, cut and packaged, folded and shipped, to reach you, one way or another, and land in your palm. Pick it up. Look at it. What do you see there, in the red, white, and black? Is there something in the ancient pattern and the Persian fig shape, the paisley teardrop and the flat pointed stars? A child’s thing, a trifle, a rag? What do you carry, what truth could it possibly contain? What meaning could it hold? Fear and strength. Smoke and blood. Doubt and faith. Terror and valor. The dead and the maimed. The way out and the walk down. The sacrifice given, and the salvation granted. Living. Dying. They searched for the right name. He was their first, and they felt the weight of the decision. A name is the label for a life, the first thing you’re given upon entering the world, and the heading for all you leave behind when you’re gone. Should they look to their lineage, to honor their bloodlines, or pick a name that would be free of the past, to accrue its own meaning over time? In the end, history won, as it usually does. On May 17, 1977, in New York City, the first child of Alison and Jeff Crowther was born: Welles Remy Crowther. The boy was named after a man his parents never met. Henry Spalding Welles was Alison’s great-uncle in several senses of the word, a figure shrouded in stories and tales, legends she’d heard about since childhood. A favorite of Alison’s father, Frank, Uncle Henry led an outsized life, certainly by the family’s telling. Despite living in Manhattan, he was an accomplished professional sportsman, working as a hired shot and public marksman, for Remington, America’s oldest gun maker. As legend had it, Uncle Henry once hit two hundred clays in succession in ­competition, a display to prove the accuracy and effectiveness of ­Remington’s newest shotgun. He also worked for True Temper, a manufacturer of fishing rods and reels, and was accomplished as a fly fisherman. Uncle Henry invented and held a patent for a diving plug, a wooden lure carved and weighted to penetrate the surface of the water, to help catch fish in any type of water, any time of day. For Alison, it wasn’t so much the tales as the way they were told, the spark that came into her father’s voice when he spoke about Henry Spalding Welles, the look that crossed his face. “I thought, what could be a better name?” Alison recalled. “There was just this magic about Uncle Henry.” The stories about the man, the ones her family loved to tell with laughter and pride and wonder—about beating Annie Oakley in a shooting competition, about sailing wooden boats across the ponds of Central Park, about President Eisenhower using his trout fishing flies—all shared the theme of taking a bold and unpredicted line through life. It was a name they hoped their son would make his own. Alison Remy’s own line was a gentle loop, from the suburbs of Westchester to a campus in New England, then back south to Manhattan. She grew up in the house where her father did, the house her grandfather built on Shawnee Road in the wealthy village of Scarsdale, north of Manhattan. Her grandfather and father, Frank Remy Sr. and Frank Remy Jr., shared more than the family home; both were graduates of New York University, both were dentists, and both were athletes. When Alison graduated from Scarsdale High School in 1966, she didn’t follow the family path to NYU. Instead, she enrolled in Wheaton College in Norton, Massachusetts. Founded as a female seminary in 1834, Wheaton was one of the oldest colleges for women in America. There were antiwar protests during her time there, but the small school was far from an epicenter of the countercultural unrest exploding across American campuses in the late 1960s, and the academic environment was serious and challenging. The student body, twelve hundred women by the time Alison graduated, was expected to be diligent, studious, and involved. That worked for Alison, who was a dedicated student with a passion for environmental studies. She headed the first Earth Day celebration on campus. For Jeff Crowther, the fact that his first date had canceled, upsetting the night’s original plans, fit his own line well enough. If there was a prescribed path, odds were he wasn’t following it. Jeff had grown up in White Plains, a larger, more diverse city just north of Scarsdale. His family had its roots in Maryland, but his father’s work brought them to New York. Bosley Crowther, a New York Times reporter, writer, and critic, spent forty years with the paper. As a student at Princeton, he entered a current events contest cosponsored by the Times and a new weekly magazine called Time. His essay, on why the Calvin Coolidge administration should withdraw its forces in Nicaragua, won first place. The prize? A five-hundred-dollar check and a job offer with the New York Times. Starting as a cub reporter in 1928, Crowther worked his way up to general reporter, rewrite man, feature writer, and then, in 1940, the paper’s chief movie critic. He held the position for twenty-seven years, becoming an institution. Bosley’s reviews held extraordinary weight, often setting up films for success or failure. Though his father and grandfather had attended Princeton, Jeff went in a different direction. At his mother’s suggestion, he headed to Clark University in Worcester, Massachusetts, a respected academic institution, though not overly challenging for him, at least not at first. He sailed through freshman year without developing any impulse to study, or even to attend classes regularly. By the end of his sophomore year, after spending his time betting on horses at a local track, playing pool in the basement of his dormitory, and impressing buddies as the social director for his fraternity, he was summoned by the dean and told he needed a break, to refocus. “I got thrown out” is how he characterized it. Without telling his parents he had been suspended, Jeff took a step few saw coming: in the summer of 1965, he joined the navy, and was stationed in San Diego for his two years of service. By the time he returned east, he held a different, wiser view toward his college opportunity. He met Alison Remy just as he was getting ready to resume life as an undergrad, this time at NYU. Her father was considerably less moved. “Don’t be silly” was his reply. A few miles north, Jeff told his mother the very same thing that night. Alison had an intuition, a burgeoning feeling, about the night, about all connected to it—the man she’d met, the feelings he sparked, the summer fading and the autumn approaching. Even about the date itself. “I will never forget thinking,” she recalled more than four decades later, “this day, it’s going to have a special meaning for us. I had a powerful sense about it, not only that we just met on this date, but there was something else that was going to make this an important day for our family . . .” Her voice trailed off. The date was September 11. She graduated in 1970 with a degree in biology and landed a job in medical research at one of the most prestigious addresses for research in the country, Rockefeller University. Alison was going back to New York. At Rockefeller, she was assigned to help with lab work on a project led by Dr. Vincent Dole and his wife, Dr. Marie Nyswander, who were pioneering the use of a new treatment for heroin addiction. The couple had developed a synthetic medication, ­methadone, to reduce the intensely painful symptoms of withdrawal that so many addicts experienced in trying to get clean. At the time, addiction was widely seen as something other than a medical problem, viewed through a moral lens, as a defect of character. The doctors rejected that notion and pioneered the use of methadone to help ­addicts wean themselves from heroin. For his work, Dole would receive the Lasker Award, one of the greatest prizes in American medicine. Alison was working on lab experiments with mice and rats, injecting the rodents with radioactive methadone to track the effects over a span of months. She was also dating. And on a ferry ride to Martha’s Vineyard in the fall of 1970, Jeff proposed. The wedding was the first day of May 1971. They moved to an apartment in Hastings-on-Hudson, a quaint village in Westchester, and began a life together, Jeff as a banker and Alison continuing as a research assistant. They wanted to start a family, but it took awhile to happen. Alison stopped working at Rockefeller in 1976, to avoid any further exposure to the radioactivity in her lab. Later that year, she and Jeff told the family the news. Alison was expecting. The slide show still plays in the father’s head, a perpetual reel. No conscious decision clicks its carousel to life or chooses the sequence; there’s no beam to ignite the dust floating between lens and screen. There is no screen at all, no place outside his head to play the slides. The pictures explode across the sides of his mind, sometimes with enough force to tighten his chest and steal his breath. Every frame contains his son. A boy blossoming, awkward and ­beautiful, unfolding into his own life. Rarely are the portraits from milestones, from the passages through the razor wire of adolescence, the first Communions and junior proms, the formal poses and family events, the birthday parties and holiday dinners. Those have moved to the background somehow. The father can’t stop the show, even if he wants to. He knows he won’t ever keep them away. The visions come, uninvited and beyond any governing, a tax on his sorrow. The pictures thrill and sear him, comfort and afflict him. The picture just now is the first frame in a short movie. The son is just a toddler, not even three years old. He is down on the floor in the living room, playing with the family dog. The two wrestle over a toy, which is the dog’s property, the dog biting and the boy pulling, each holding on with all his might. The dog is bigger, stronger. From room to room, the father watches as the dog drags his son around, both wild with delight, neither willing to let go. They play until each is exhausted. At times when the boy’s grip weakens, his balance falters, and he slides into furniture and crashes into walls. But in the picture in the father’s head, the boy won’t stop, or cry, or look for help. In his tiny movie, flashing frame by frame, his son goes right back at the dog, until the dog is too tired to keep fighting. The game always ends the same way, with the toy in the boy’s hands. He knew what he wanted to do, and to be. From the time Welles was in preschool, when he was asked about his future, he had an immediate and confident answer: he would be a fireman. Not like the ones in children’s books, but like the people who shared his name and his house. From the time he was a tyke, both his grandfathers would take him to the firehouses in their respective cities—Alison’s father, Frank, to the red-tiled, brick-faced, double-doored Fire Station No. 2 in Hartsdale; Jeff’s father, Bosley (whom the grandchildren called “Geeps”), to the firehouse in White Plains, just a few blocks from his house. They made the visits not because they were volunteers themselves; they saw the shine in their grandson’s eyes, and fed his wonder. Welles also liked to spend time with Geeps in his home office, “playing business,” as the boy called it, hiking himself up behind his grandfather’s enormous desk in the sunroom, where Bosley would spend time writing. The interest in business would also last through most of his life. But it was an interest. Something to do. Not something to be. It wasn’t firefighting. The fireman’s ideal was a magnet for Welles, as it is for so many boys of a certain age. The jubilant blast of the siren, the unpre­dictable call in the night, the monstrous gleam of the ladder truck, the fearsome power of the hose guns, the boots and turnouts and helmets, and the real and irresistible pull of fire—its brilliance and drama and danger. A living thing, a real and attacking beast. The appeal lay in all of it, and something more, the chance to live out and execute an edict every child is taught but most forget fast: to help. Christmas 1981, when Welles was four, his grandparents had a special gift for him, a blazing red ride-on fire truck. Upon first seeing it, Welles, who was formally dressed for the holiday in his little Eton suit, stood back for a few moments, as if uncertain how to proceed. “He was afraid to go near it,” Alison said, picturing the scene. “He couldn’t believe it was real. He was just so in awe of his fire truck. Maybe he was trying to figure out how they shrunk the truck down.” So Welles simply stared at the small metal engine, with its black wheels and bright chrome and beckoning seat behind the steering wheel. How did Santa get it down the chimney? Eventually, he walked toward it, sat down in it, and attempted to maneuver it around the room. The pedals were indeed difficult to crank, and soon the gleaming red sides wore a coat of dust. Even though Welles would ride it at times down the sloped driveway, screaming with joy, wild to the world, he outgrew its small frame soon enough, and the toy went downstairs in a corner of the house somewhere, ignored and unused. But the memory of the day, of the gift beside the tree and Welles under its spell, remains. Copyright © 2016 by Tom Rinaldi. All rights reserved. No part of this excerpt may be reproduced or reprinted without permission in writing from the publisher.